Wanna Help Me House Hunt? So, we’re living in a rental and looking for a new house to buy. Don’t get me wrong, not having a mortgage is pretty hot, but the rental is actually a teeny bit smaller than the house that we just sold because we needed more room, so we’re a little bit ready to say farewell to the In-Between House and fall in love with our Forever House. We’re hoping to find a home we super, super love and stay there for 20+ years, or at least until the kids are all out of the nest, or at least at least until the sky falls–whichever comes first. So I’m bringing the noise and the picky to this house-hunting party. Are you picking up what I’m putting down? It’s a modern house on a wooded lot in a good neighborhood. We like the exterior a lot, and love that it’s got a late-70s-contemporary thing going on, but still feels a little like a tree house. Lots of windows, plenty of light, that kind of thing. Sadly, in 2000, the owners (who are the original owners, and quite frankly should have known better) did a remodel and made it all…like this. SUPER traditional. Moulding, woodwork, trim, whatever you want to call it: it’s everywhere. 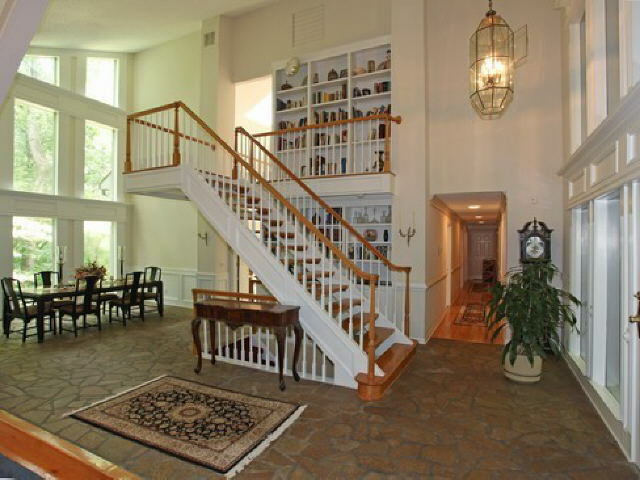 Every floor-to-ceiling window, every nook and cranny, the two-story bookcase, the stairs. All very, very traditional. The work is exceedingly well done, and actually very pretty–it just SO doesn’t look like it belongs in a house with this exterior. The mismatch is giving me a hard time. Now, I should say out loud that there is no house in the world that is turn-key ready for me. There just isn’t–most of us want to put our own stamp on a home, and if you’re at all crafty or DIYey, you’ll have that compulsion more strongly than others. So for me, I don’t want to buy a house–no matter how great a deal it is, because we are prepared to super low-ball these people made a huge lowball offer–unless I know it can be the house I want it to be. My question is: what would you do? I mean, this all might be a rhetorical exercise anyway, since they could very well completely and somewhat rudely rejected our offer (we put THREE on the last house I loved, and lost it every time, so it’s totally within the realm of reason that seemed almost certain we wouldn’t get this one, either). But ignoring issues of budget or time or skill, if you were to buy a house like this one, what would you do to make the insides match the outsides?? If it were me and I had unlimited resources, I’d first tear out that nowhere-close-to-the-right-scale chair rail stuff. I’d probably keep the bookcases, because I love bookcases. I’d tear out the stairs and put in a set much like the Brady Bunch’s – modern no-riser stairs with some sleek banister action and maybe cables running long-ways between the stair treads and the banister top. Agree totally with the above. I would recommend gutting the entire inside, at least the molding, and returning it to its former streamlined glory. Lorraine Enwright is a local architect/designer in whose most recent house I had the pleasure of spending the evening. She has the perfect stairwell for you. Clean, sleek, and the railings look kind of like slim steel cables, but not in a yucky, industrial way. If a house can be modern and classic, feminine and cleancut — she is the one to do it. * This commenter received no good or services for promotion of above architect. When we were talking about this house, the plan was to strip the moulding and see what was beneath–we suspect that there are ceiling beams with the original mahogany still under plywood. Eeek! Sadly, they wanted a LOT more than we offered–so we’re going to let it sit and see if they change their mind once the weather cools off. We’re in no hurry, and considering the amount of work we’re talking about here, I can’t justify spending much more than we offered them. I wouldn’t do anything to either the inside or the outside. I love both just as they are and I also love the fact that you get something totally different inside than you do the outside. Like walking into another world. I would just make the inside more to me than remodeling to make the inside look like the outside. Go figure, I would change the outside! I was going to suggest a “Brady Bunch” stairwell as well! Scrap the chandelier as you enter and put something in more modern or vintage. I’d try painting it all which can diminish the traditional look. I like the idea of changing the stairs to be more brady bunch! The inside can be fixed by some paint and stain, and a new chandelier (and a new floor, but that’s pricier). It’s the outside that would send me running form this one. So dark and uninviting. I’d paint it a dark red. We have a contemporary style home ourselves. I wouldn’t like the traditional features of the one you showed here – but it certainly has potential. All that light! I can see ditching the wainscoting and light fixtures, changing the staircase, and doing something with that floor. I feel your pain here – there is badly done crown moulding in our contemporary home. And some weird intricate woodwork around the ugly stone fireplace. We finally have an AWESOME contractor who built a patio for us and we are so thrilled with him, we’re going to work with him on our living room and that crappy fireplace. I’ll email you his info and if you want before and after pics from us I can send to. He was AWESOME to work with, the work is terrific and it was a good value. For the front of the house, I would rip out that rickety wooden walkway and create a patio space extending to the right in front of those windows. A good place to sip a drink and watch the kids play outside! I think I would go after the wainscot with a screwdriver the first chance I got. But yes: the light! the ceilings! the Brady Bunchiness of the whole idea of it! It has a *lot* of potential. If we decide to go back in a few months and offer again (to see if they’ve changed their minds/lowered their expectations), I’ll for sure want to contact an architect–would love to see your before & afters! P.S. The wooden walkway goes over a teeny creek that flows around to the back of the house and meets the larger creek down at the back of the property, so when you’re right at the front, it’s kind of nice. Plus, the set-back isn’t huge but the lot is very deep, so I vastly prefer the back view to the front. Usually, I’m all about a front porch, but something about this house doesn’t seem to want to co-operate! This house is much like ours. 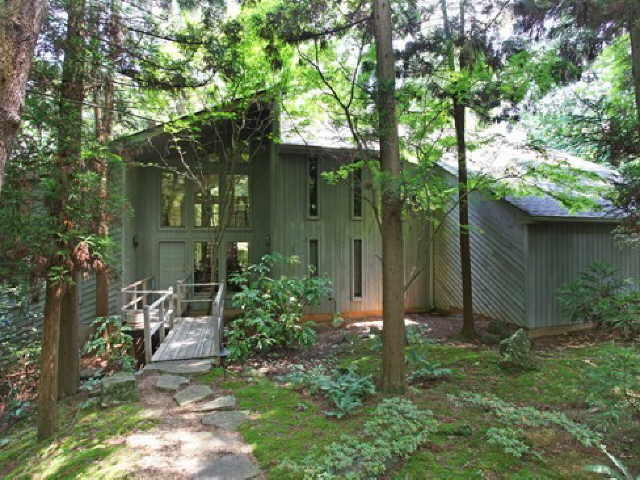 We also have a wooded lot and a creek too. Our basement had some fantasmo bright salmon carpet when we moved in that has been replaced with a nice clean grey. I would tell you to look in our neck of the woods (East Cobb, land of the soccer mom) but I figure you need/want to be more intown. There are some BARGAINS near us, so much that we have even considered an investment property. But in the end, we don’t feel equipped to deal with renters. Best wishes on your house hunt. I hope you find the perfect house. Plus, I am SO looking forward to blog posts about the magic you perform on your new abode! am i the only one that finds the inside as a wonderful surprise from looking at the outside? i can’t think of anything more beautiful than all those windows! I know, isn’t all that light grand?? It’s what we both like about the house so much–you can live with a lotta mistakes if you have enough sunlight! I love it from the outside. Love treed lot. I live on the edge of a forest and it looks to me like that house belongs right in it. Does it have a basement? Any chance of the creek flooding? Skip the brady bunch stairs. There are so many houses here with them and I always cringe imagining one of my kids sliding through them! I’d leave the stairs and definately get a more modern rail. Love the natural light, but that light fixture……Ewwww! The WHOLE lot is trees, and part of it would need a little clearing (some branches are down from recent storms, etc), but my husband really super likes that it’s woody back there–he envisions tree forts and tire swings and adventure playtime with the kids, mini-hikes in the back “forest,” that kind of thing. So, yeah, we love the woods. No real chance of the creek flooding–it’s teeny and the lot is really deep, so technically the creek is just over the property line, so we’re good. It DOES have a basement, which is in moderately rough shape (some very sad, beaten shag carpet), but has a big unfinished area that my husband said I could drywall and have For My Very Own, so that was nice. Ah, well. Better hurry up and wait on our Perfect House to come along (at the right price). Oh, and the stairs already have open treads, so I figure: if the danger is there one way or another, why not make it pretty? My gut feeling tells me that the current owners will want to recoup their expenses for turning the inside of the house into the ‘traditional’ nightmare that it is. When the husband and I were house hunting about 2 years ago, we ran into a similar situation. We found the most gorgeous 60’s mid-century modern split level house. But the current owners had remodeled the entire house with contemporary in mind – but it wasn’t most fitting to the actual house. Think of Home Depot’s idea of contemporary. The house was very nice, but the owners weren’t willing to budge in price after spending $40,000+ in renovations. And I didn’t want to spend the extra money for someone’s renovations that I hated. I would prefer a house that may look ‘dated’ inside, which means it will usually sell for much cheaper, that way I could do my own renovations in the style I want. The husband and I eventually found a similar mid-century modern split level and the kitchen had been remodeled, with a very modern sense. The kitchen is gorgeous, but not exactly what I would have done. I probably would have gone for a more retro vibe. But because the kitchen was tastefully remodeled we ended up paying more for the house. If you like modern looking homes with wooded lots, you may want to check out the Northcrest subdivision (http://www.northcrestmodern.com/) in the Spaghetti Junction area. It’s where I currently live and it’s a great place to be. Some of the homes that haven’t been remodeled can go for about $200,000 – $240,000. I’ve been casually house hunting in the Atlanta area for 7 years – looking for our dream home not a “because we need to move” home – and there are a TON of them in the same style. Usually the interiors are very dark, the trim is dark stained, rough, cedar planking, not unlike the cedar siding on the outside. So, even though it’s mismatching, I’d look on that interior as a blessing. And I am absolutely not a “traditional” style person. I think with some paint, new lighting and maybe new stair rails, you can make it more cohesive. Another step in and take off the extra trim. It is most likely a surface trim and not thick cut molding so it shouldn’t be too hard. However, as evidenced by my very extended search, I’m personally rather picky so I can’t blame you a bit if you don’t go for it HA! On this particular house, I would put modern wooden floors (you can probably simply glue it on top), remove the moldings and wooden panels on the walls. and totally redo the staircase. The windows and space are to die for. Keep it white. http://www.caststairs.com/ing/prodotti.html (I will send you specific images) Eventually we bought this one in white http://www.fontanot.it/reflex-titan/ I love stainless steel. Wow! It is very mis-matched. Not the inside I would have thought. hey, if its a forever house, you’ve got a long time to make it the way you want it. it doesnt all have to be done right away. i’ll bet it would look 10x better with a new chandelier, and some color. Really it seems mostly the furniture needs to change and the ugly light fixture…paint the stained bits of the stair case white and you have a blank canvas…what is the kitchen like and what are the sewing spaces like…looks lovely on the outside…go for it!! my first instinct was to change the stairs- make them more urban. That will make a world of difference. Changing the lighting in the entrance is a quick fix and taking down the chair rail will make a word of difference. whoa. that is like apples and oranges. it’s so stark inside! it needs to be cozy! I, too, am house hunting in Atl right now! I don’t think we’ll fall in love with the same one though because I *want* something more traditional. Although not like that house has going on! I think the floor in that area needs to be ripped out and replaced with concrete, or maybe terrazo as that has some texture and is making a resurgence in modern structures. Good luck finding a house.